The AZ Experience has over 15 years in the field of music and professional entertainment. We provide service for corporate parties, weddings, receptions, non- profit events, birthday parties, bar and bat mitzvahs and other celebrations. 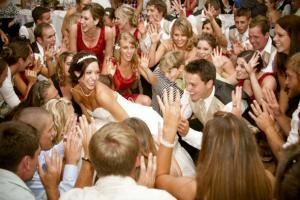 We are expert in DJ service as well as event planning and lighting services. A husband and wife team, we ensure your event is well planned in advance. From the order of events to the music preferences we use our online planning tools to remove the stress so you can enjoy your event. We meet in advance and discuss your vision and offer our experience in partnership. You have 24/7 access to our online planner tool and we work closely to ensure all the details are set. We work to communicate the timeline and details to your other vendors well in advance, so everything flows smoothly at your event. Our music library consists of the classics, elegant background music and progresses through today's radio hits. Our sound systems are professional top name components to maintain the elegant image while allowing the party to last long into the night. Our equipment is disguised behind a LED light screen set to your colors, taking just over 4 feet in space. We can ensure your party is a musical success and get everyone involved. The essentially tastefully delivered. This package includes Michael and Jennifer as your DJ/MC's for four hours with unlimited music requests, our 2400 watt sound system, dance floor lighting, online wedding planning tool, free setup and breakdown, a 1 hour consultation. This package is limited to 4 hours of performance time. Additional hours can be added at the rate of $125 an hour.